Coldframes are great solar powered seed starters that you can use year round. If you’ve built one, used it in the spring, then left it to become overgrown with weeds for the rest of the year, now is the time to rethink that. This can be your go-to place for transplants all season, plus a place to harvest winter salads while waiting for the next round of seeds. I generally start planting in my coldframe in early February with cabbage, collards, kale, chard, and other cool season things. If I am starting onion seeds, I might plant them in the coldframe in January. My next round of planting is for the warm weather crops, such as tomatoes and peppers. These are started about the last week in March, however this year it was April 5 when that happened. This year was a good year to not be in a hurry, since the weather was unseasonably cold and damp for longer than expected. When I started seeds under lights in the house, I used to start tomatoes and peppers on March 1. They would require a lot of attention and watering. When it was getting close to time to plant them outside, I would have to harden off the plants—get them used to the outdoors—before they actually got planted in the garden. I’ve seen people having to do this with greenhouse plants. They would lug them in and out of the greenhouse each day. Whether you are taking them in and out of your house or a greenhouse, it’s a bother either way. As I’ve gotten older, I like to think I’ve gotten smarter and not just lazier. I realized that I don’t have to start my tomatoes so early. The plants that come from my coldframe are acclimated to the cool soil and to the fluctuations of air temperature from day to night. I can keep the lid on, vent it, or remove it totally, as necessary. I do not put hinges on my coldframe lids for that reason. If they are light enough to be blown off in the wind, I use hooks and eyes to hold them in place. I can start more plants in less space than I ever could starting them under lights in the house. Our last frost date here is about April 25. This year, however, frost hit in some places on May 14. It is good to have plants already tuned in to what nature is doing in times like this. A cold snap like that would be more damaging to tender plants raised under lights, than to hardy plants grown in a coldframe. Sometimes I pull plants out of the coldframe and put them in pots or wood flats to finish growing out so that I have room to start more seeds. I only do that if the weather conditions are such that the ones I pull out don’t need the protection of a coldframe anymore. 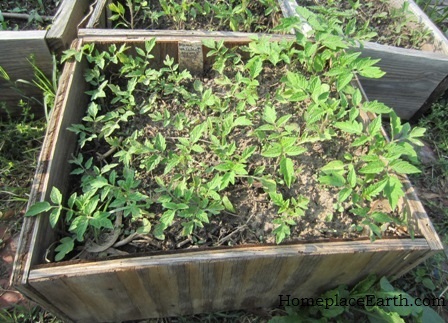 I had done that this year with the tomatoes to make room for the sweet potatoes in the coldframe. Peppers grow slower and need warmer conditions than tomatoes. When I turned to the coldframes for my transplants I wasn’t sure how it would be with peppers. I’ve since decided that this is a great opportunity to develop a pepper that will grow this way. Otherwise, why would I want to fool with it? If I save the seeds each year, I will have developed a strain that will grow well, no matter what nature brings. I like thick walled sweet peppers and Ruffled Hungarian is one that does well in the coldframe. I originally bought a few locally grown plants at a health food store in 2008 and have been saving the seeds ever since. I use transplants for corn and peanuts and worry about voles getting them in the coldframe. Although I have taken measures in building my new coldframes to keep out the voles, I still worry about these seeds, so I start them in large plastic pots, the kind trees come in. I like the kind with a lip on the rim to keep climbing critters out. These pots are scrounged, I didn’t buy them, and they are useful for many things. When the corn and peanuts are out, I can put other seeds for transplants in there or plant flowers and herbs to enjoy through the summer. Since I’m using them at a time when no protection is needed, I don’t have to worry about a cover. These extra containers are good to have when my coldframes are filled and I want more seed-starting space, once the danger of frost has passed. 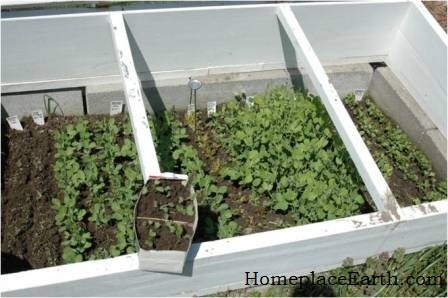 Once all the warm weather plants are in the garden the coldframe is the place to start transplants for later squash plantings, more flowers and herbs, or for brassicas plants intended for fall and winter harvest. You no longer need the winter lids to keep things warm, but you might need some shade. If you don’t have shadecloth, you can use an old bed sheet to shelter the seedlings from the sun. The key to this kind of planting is having a plan that shows everything that will be in your garden for the year. For a refresher for that kind of planning, read my post on Making a Garden Map. You will know what you need ahead of time and can plan your coldframe plantings accordingly. My post on Succession Planting will also give you some ideas for using summer transplants. If you really aren’t interested in having a continuous supply of transplants though the summer, plant a crop in your coldframe after the last spring transplants come out. I have built a new coldframe to replace an old one and have planted potatoes in it to see if I was successful in keeping out the voles—otherwise, the sweet potatoes would be in there and I wouldn’t have had to put the tomato plants in flats. 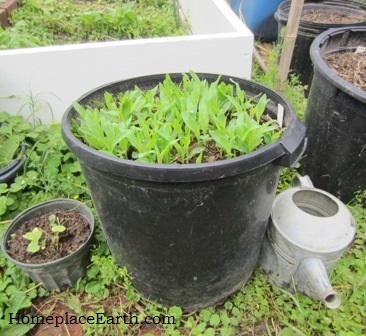 You could shade your coldframe and plant lettuce or just throw in some buckwheat. In thirty days the buckwheat will be flowering, making the honeybees happy and keeping the weeds away. In early September I plant lettuce in one of my coldframes to provide salads through December. I want that space to be clear for the January/February plantings. I plant the winter greens-kale and collards—under low tunnels. If they were in the coldframes, they would still be there when I wanted to start seeds. Think of your coldframe as a place to harvest transplants all through the summer, not just in the spring. Consider it an important part of your garden and keep it filled. Keeping chickens is a popular thing to do these days and there is a wealth of information for new keepers of the flocks. I have had chickens since 1989 and would like to offer some tips that have proven helpful to me. 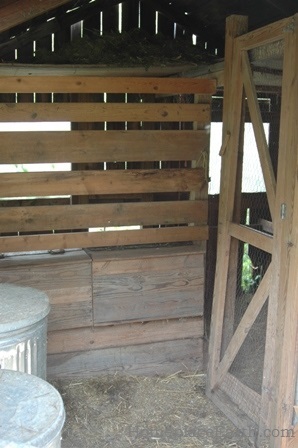 If possible, have an area to store feed within the chicken house. That saves trips back and forth from another storage area each day. I store feed in galvanized metal garbage cans. I don’t use plastic garbage cans because I believe they contain pesticides—after all, they are intended for garbage—and animals can chew through them. This feed area needs to be “walled off” from the chicken-living area, which can be done with chicken wire or welded wire fencing. That brings me to my next tip. In the chicken-living area, it would do you well to arrange to divide that space into two. I read that idea long ago in Gene Logsdon’s Practical Skills (1985, Rodale Press). In my chicken house the divider is made of welded wire fencing for the upper permanent part and wood for the lower removable part. A nail at each side of the bottom part holds it in place. When I want to allow the chickens into the whole area, I remove the bottom panel by pulling out the nails enough to remove the panel. In order to tend to both sections, you need to have a door to each one from your feed room. The doors can be made with a wood frame and wire fencing or you could scrounge old screen doors for this. This division is most helpful when my chicks come out of the brooder. The outside pen area is divided, also, so that each inside area has its own run. One side, where the chicks are put, has smaller wire to contain the little ones. The rest of the chicken run has 2”x4” wire. Young chicks can slip right through that. The chickens, big and small, can see each other. When the time comes, I can take off the bottom panel in the chicken house and open the gates within the chicken run and they will all be together. My next tip is to be able to collect the eggs without walking through chicken poop. You might not mind it, but occasionally you might need to have someone else, who is not so much into earthy ways as you are, collect your eggs. Also, chickens can be intimidating to young children and a rooster can be an attack animal. It is best if children don’t have to watch out for that, besides making sure they don’t break any eggs. 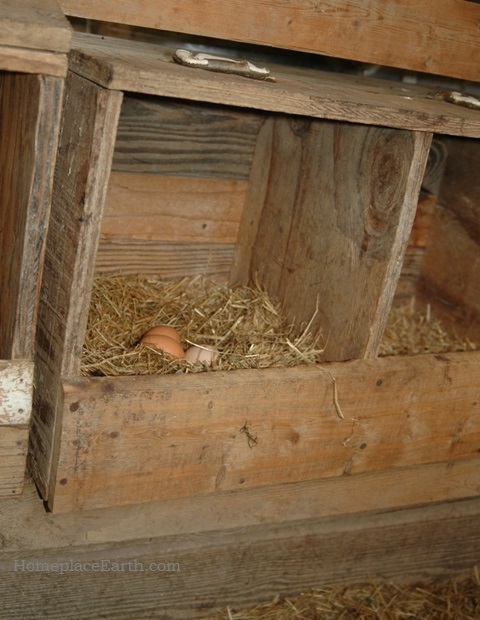 If you have a feed room, have the nest boxes protrude into that space, with the top opening up for egg collection. 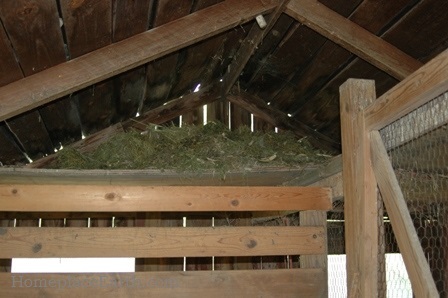 If your nest boxes extend to the outside of the chicken house, make sure they are weather-proof. You wouldn’t want rain dripping on your hens as they sit in the nest box. My nest boxes are accessible from the feed area. I made them from scrap wood and used the tongues of old tennis shoes for hinges. My last tip is to put a loft in your chicken house. That gives you space to store straw for bedding—maybe even straw from the grains that you’ve grown. The loft in my chicken house is only over the chicken-living area, allowing more headspace in the feed room. I have an old wooden five foot ladder there to access the loft. I add carbon material over the chicken droppings throughout the year and clean out the chicken house once in the summer. All of it goes to the compost pile. Having that bedding material right there in the loft is nice, especially if it is something I’ve grown. You can also store grass clippings there. If you have sown white clover in your grass, your “grass hay” will be rich in clover. You can feed that to your chickens, line the nest boxes with it, or use it as bedding. Let the grass dry for a day or two before storing it or spread it out in the loft if it is fresh. When it is dry, you can pile it up. Otherwise, you will have a hot, slimy mess. Look at all the resources you have and make sure they are part of your circle of living. What is left from one thing becomes a resource for another. As much as you can, bring your chickens into your circle.